The Fujifilm FinePix F100fd (announced 24 January 2008) is a 12 megapixel point and shoot digital camera with a 5x optical zoom lens (28 mm – 140 mm) and 2.7 inch LCD. This SuperCCD based camera features sensor shift image stabilization, face detection 3.0, red eye removal, 16 scene modes, ISO up to 12800, and 1.7 frames per second shooting at full resolution. The Fuji FinePix F100fd will be available in March 2008, with a retail price of about $380 USD. Combining a 12-MegaPixel, 8th Generation Super CCD with a powerful Fujinon 5.0x wide angle optical zoom lens and a 2.7” high-resolution 230,000 pixel wide angle view LCD, the FinePix F100fd is among Fujifilm’s finest compact digital cameras. As with previous F-Series models such as the FinePix F31, F40fd and F50fd, the F100fd is a powerful, feature-packed compact digital camera aimed at consumers looking for something well above the average model. It offers the most advanced technologies available, including Wide Dynamic Range, Dual Image Stabilization, Face Detection 3.0 Technology with an Automatic Red Eye Removal function and ISO settings of up to an unprecedented ISO 12800 – so missing great shots is not an option. Dynamic Range, or the gradations of light that exist between bright and dark in any setting, can be easily detected by the human eye, but not by most cameras. Fujifilm expanded dynamic range capture functionality on the professional imaging side with its FinePix S3 Pro digital camera. 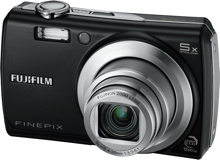 The technology, now perfected in the FinePix S5 Pro camera, has been brought to the consumer in the FinePix F100fd. Through a combination of advances in Fujifilm’s new Super CCD HR VIII and RP (Real Photo) Processor III, this wide dynamic range dramatically broadens tonal capability and guarantees exceptional rendition of photos with both bright highlights and dark shadows. This expansion of sensitivity captures greater detail, and subtle nuances of brightness and tonality that bring the photo closer to what the human eye actually sees. The FinePix F100fd features Fujifilm’s Dual Image Stabilization mode which combines a mechanically stabilized Super CCD sensor with high ISO sensitivities for total anti-blur protection. The combination of these technologies reduces the “blur” effect from the photographer’s hand-shake and subject movement even further to provide the highest quality digital pictures yet, with sharp, clean and clear results. Thanks to the 8th generation FinePix Super CCD-HR chip and the RP Processor III, the Finepix F100fd can utilize ISO settings of up to ISO 3200 at full resolution and an amazing ISO 12800 at reduced resolution1, capturing stunning images even in low light while preserving the natural color and clarity of the shot. * Dual Image Stabilization: Combine mechanical image stabilization with the effects produced with higher ISO. * Continuous Shooting: Top/Final 3 at 1.7 frames per second at full resolution and Top/Final 12 at 5 frames per second at 3-MegaPixels. * High Speed Playback: No waiting for high resolution images to load during play back. The FinePix F100fd can display images at full resolution at 10 frames per second. * Portrait Enhancer Mode: Mimicking a professional photo studio setting, by using Face Detection and preset camera settings, Portrait Enhancer minimizes fine lines and small skin blemishes for smooth, natural looking portraits. * Dual Shot Mode: In this selectable mode, the FinePix F100fd quickly shoots two images in rapid succession – one with the flash and one without – and saves both. This convenient function lets users perform a comparison at their convenience and select the most pleasing image. * Special Scene: The FinePix F100fd has 16 pre-programmed scenes, including a special underwater scene mode for use with a special underwater casing. Also, a Blog mode that automatically reduces the size of copied images for easy posting to a blog, Web page or email attachment. * Micro Thumbnail: A playback feature that allows for viewing an index-style print on the LCD. The FinePix F100fd will show up to 100 images in micro form, then the control buttons are used to select specific images. An innovative wheel navigation dial makes it easy to quickly find a single image by being able to jump to particular segments of images in the time sequence. * IrSimple™: Infrared communication via IrSimple™ technology for fast, easy wireless image transfer to a compatible device. * xD / SD / SD-HC Compatible slot: The FinePix F100fd features a “xD/SD Compatible slot” which accepts not only Fujifilm’s traditional xD-Picture Cards but also Secure Digital (SD) and SD-High Capacity/SD-HC cards too. The FinePix F100fd will debut in March 2008 at a retail price of $379.95. This entry was posted in Fujifilm and tagged Fujifilm, Fujifilm Finepix, Fujifilm Finepix F Series on March 11, 2008 by jonathanb.